Omid Djalili’s autobiography is full of surprises. Since he’s never been one to use much of his real life in his effusive stand-up, Hopeful gives a revealing insight into the makeup of a perennial entertainer through an eye-opening series of frank and funny anecdotes. Yet while he keeps life stories out of his comedy, his comedy is largely excluded from his life story. Though this book spans the time from his birth through to Splash!, aside from a hilarious retelling of the unintentional slapstick farce that was his second gig, his stand-up career is barely mentioned. That odd major omission aside (maybe that’ll be the sequel?) we learn much of the path that Omid took to get where he is today. He was born in Kensington in 1965 – seven years after his parents left Iran. His name means ‘hope’ in Farsi, hence the title of this book (and his gag that ‘Djalili’ means ‘less’). He briefly visited Tehran, long before the revolution, and recalls both a cinematically epic snowball fight that spontaneously broke out on the streets – started by his family – and falling into an overfull cesspit in his grandfather’s house – typical of the evocatively told stories with himself at the centre. Although he was raised in the UK, and his childhood was certainly unusual; his parents kept their flat as a virtual open house, accommodating a never-ending stream of strange, loud visitors from Iran, since word spread quickly that this was a welcoming home. As a consequence of having no privacy and little normal family life, young Omid was left alone to find his own entertainment, and became adept at living in his own world – and surprisingly prone to getting into fights. He also developed skills as a specialist translator. Many of the visitors came to London for medical treatments – not on the NHS, Djalili is quick to point out – and he would often be the only one who could communicate the technicalities. His solitary upbringing gave him certain Walter Mitty-like tendencies, and after flunking his exams on several attempts, he got a university place by simply forging the certificate. His chutzpah paid off, and not for the only time. Even then he decided the University of Ulster was not good enough for him – and attempted to blag his way into Princeton, even flying out to New Jersey on a whim. Unsurprisingly, he ended up back in Northern Ireland – where he was threatened by paramilitaries. On finishing university he became a driver, until chauffeuring around the spoilt children of privilege and their demanding mothers became too much. But throughout his life he’d enjoyed being on stage, and decided to pursue that. Again he found getting into drama school difficult – he seems affronted that one course rejected him for not being a team player… though his entire life up to that point seems to be a largely isolated one, save for playing football. However he found a his true home in Fringe theatre which took him – via a stint in Czechoslovakia as that country was splitting apart – through to his Hollywood roles that called for a swathy ethnic actor. And his party trick of entertaining the rest of the cast and crew on-set by acting out the imaginary swashbuckling jinx of an Arab action hero suggests he hasn’t entirely lost that ability to entertain himself with his own playful imagination. It was also through theatre that he found his love, Annabel, despite the excruciatingly awkward courtship. The message here, and indeed through his career, is that persistence and good nature pay off in the end. In the meantime, his efforts in getting there provide a hugely entertaining read. 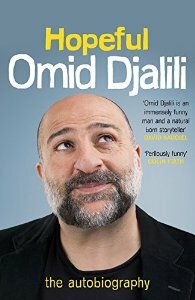 • Hopeful by Omid Djalili is published by Headline, priced £20. Click here to buy from Foyles for £15.